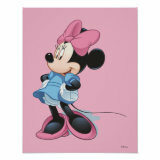 Minnie Mouse Bedroom - Oh So Girly! This cute pink and black Minnie themed 4 piece Full Sheet Set together with this Reversible Twin Mini Comforter Set with Sham make a cute choice of Minnie Mouse themed bedding. When I was a little girl I remember looking on very proudly at the sign on my door that stated that a room in the house was just for me! 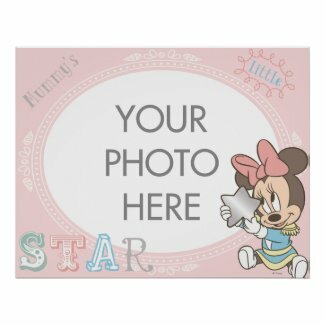 If you think your little girl would like this too, how about this sweet Minnie Mouse girls bedroom door sign? It’s sold on Amazon.com and the name is completely personalizable. To get your girl’s name on the sign, simply write the name in the “Gift Message” section of the check-out. Keeping with the Minnie Mouse theme, you can even get Minnie Mouse trash cans! 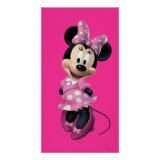 There are a lot of colors of Minnie Mouse posters to choose from on Amazon.com and on Zazzle, but I’ve chosen the ones that best fit the pink, black and white color scheme of this bedroom.